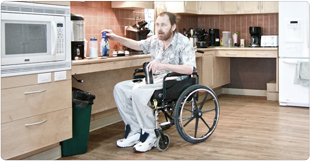 Inclusio is a home for 45 Calgarians with limited mobility. Inclusio is located at 1129 23 Ave NW in the community of Capitol Hill in Calgary, Alberta. It features 45 studio apartments, shared common living spaces and patio spaces on each floor, a dining room and meal services, as well as beautiful views over Confederation Park. The building is safe and modern, featuring concrete construction. Inclusio is supportive living, meaning residents have access to many types of supports for activities of daily living, such as health care aides and case management services. Inclusio is also affordable housing, meaning all residents earn less than $46,000 in annual income. Inclusio was designed for adults over the age of 18 who require some assistance with their daily lives, but also value autonomy and interdependence. What services are provided at Inclusio? 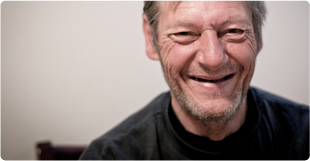 At Accessible Housing, supportive living means a place where you can get the help you need, when you need it – but where you’re encouraged to be independent in the ways you’re able, when you’re able. For some residents, this means they only occasionally need assistance with daily life when they’re having a bad day in terms of their health condition; for other residents, it means intensive assistance getting ready for the day, and then being independent and active until the evening. Inclusio will have flexible supports that are client-centered, and client-directed. While there are a wide range of supports available at Inclusio, some program participation – such as reviewing care plans and Individualized Support Plans – are required. Other supports can be used as needed. Supports available will include case management, recreational supports, dining services, and general janitorial and maintenance. Care services are provided through a blend of Alberta Health Services Home Care, and Accessible Housing’s Resident Support Attendants. Home Care will provide routine, scheduled care, such as morning and evening routines (bathing, dressing, grooming, etc.) Accessible Housing staff are available for unscheduled care needs, such as unplanned outings, late returns, accidents, and overnight care (including responding to overnight call bells). How much does it cost to live at Inclusio? What is included in my accommodation charge? The accommodation charge at Inclusio is based on a ‘rent-geared-to-income’ (RGI) system which is a commonly used system to help determine affordable rents. The accommodation charge is a minimum of 70% of an individual’s gross income. We know that not all residents at Inclusio will have the same income; each individual’s income will be assessed, and individuals with higher incomes will pay higher accommodation charges while individuals with lower incomes pay lower accommodation charges. How do I qualify to live at Inclusio? What are the program criteria to live at Inclusio? Can I live with my family, spouse, or pet at Inclusio? Unfortunately, no. Inclusio is designed to serve single adults, and is not suitable for couples or families with children. Likewise, Inclusio will not allow pets in the building, with the exception for service dogs. Some additional exceptions may be made for visiting pets. Is there parking at Inclusio? There are six accessible parking stalls in a parkade at Inclusio, which will be available for a fee. A process will be available upon move-in, which will include an application. These stalls will be rented to residents who have vehicles and are the primary driver of the vehicle, and have a valid driver’s license. Priority may be given to residents who own vehicles for purposes such as employment, volunteering or school. Is Inclusio operated by Alberta Health Services? Inclusio is not part of Alberta Health Services (it is not designated supportive living or long-term care). It is neither run by nor funded by AHS. Inclusio is run by Accessible Housing, a non-profit organization. Some care supports at Inclusio are provided by Home Care, which is a service for Albertans funded by AHS. Is there a waiting list for Inclusio? Inclusio will utilize a short, pre-approved wait-list system, the details of which are yet to be determined, as the building has not yet opened. The Inclusio wait-list will be of residents who have already been through the Screening Tool, assessment and interview processes. What if I don’t qualify to live at Inclusio?